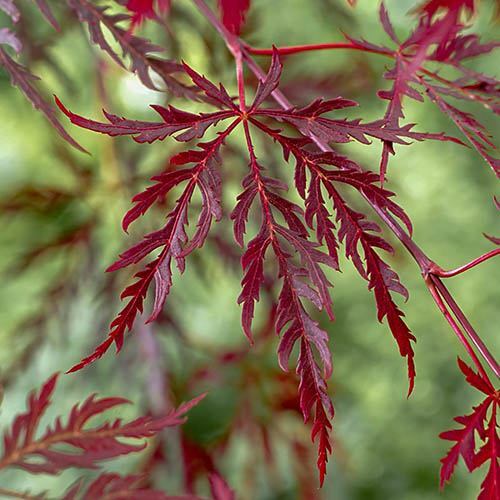 One of the best and easiest compact growing Acers for smaller gardens, pots and patios, this gorgeous red foliaged small tree offers so much interest througout the year. The 'Dissectum' part of the name refers to the very feathery leaves, which emerge in early spring the most gorgeous burgundy red, and remain in deep colour all summer, turning redder still in autumn. A slow growing, spreading tree with the perfect balanced habit, it is great as a border specimen, or in a large pot, where it can remain for 10 years quite happily - and you can take it with you if you move house!. A great investment for any garden.